ExpeditionDan: The Beginner Hiking Series: Buying your first pair of serious hiking boots. The Beginner Hiking Series: Buying your first pair of serious hiking boots. At some point nearly every new hiker will want to begin to progress from easy, beginner hikes to something more challenging. Up to this point, I have been advocating light hiking shoes and trail runners for the beginner. Don't get me wrong, these shoes are fantastic for their intended purpose - short day hikes on relatively well maintained trails - however, tougher terrain and longer hikes will really push these lightweight shoes to, and often past, their limit. This post will show you how to wade through the endless styles and types of boots and to pick out just the right pair for your needs. To help illustrate this process, I will have you follow along with my wife, Robyn, as she picks out a new pair of hiking boots. Walking into an outdoor sports store and looking at the dizzying selection of hiking boots may seem intimidating to the un-initiated and rightly so. There are dozens of boots of all types and styles sporting a wide array of technical sounding bells and whistles. How do you decide which one is right for you? The first step is of course understanding just what makes up a hiking boot. Walk into the footwear aisle of any outdoor store and you will, in short order, be bombarded with an endless string of terms and technical jargon about the different parts of a boot. To give you a bit of a leg up on understanding all this, I have created a simple diagram that shows the main parts of a hiking boot. There are of course many more parts in addition to those I have labeled, but these are the areas you want to focus on knowing to help with picking out the right boot for you. While there may seem to be an endless variety of boots, there are in reality only four basic styles of boots to choose from. A light hiking shoe is most similar to a trail running shoe, but is generally made of slightly heavier material and may have a stiffer sole. 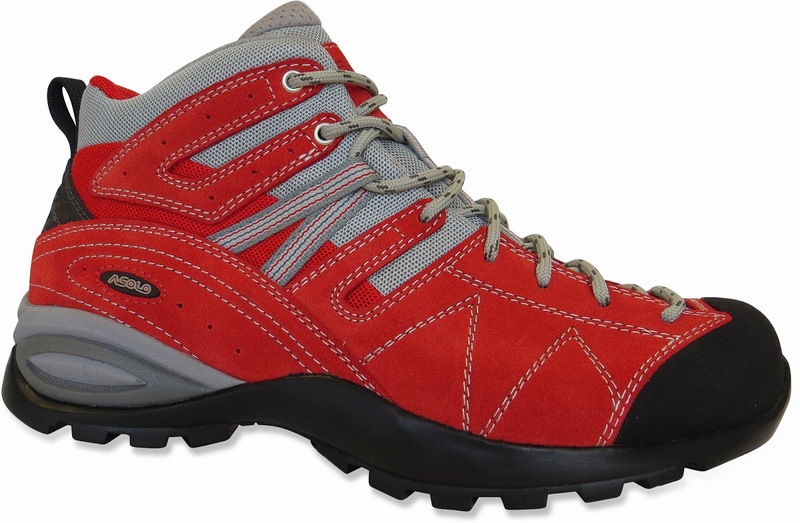 This type of shoe is best suited to short day hikes on well maintained trails or paths. Light shoes sometimes offer increased water-proofing and a heavier sole than a trail runner would. In my opinion these are generally not much of an upgrade from a trail running shoe and so I recommend that you don't bother with these if you are looking to upgrade to a more advanced boot. 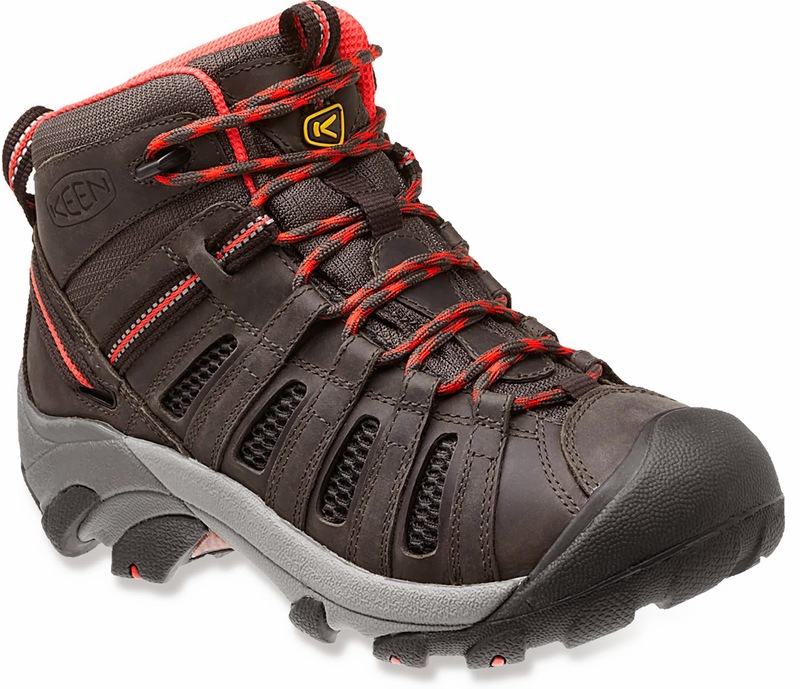 Hiking boots are really where you begin to see a major improvement over trail running shoes. These boots have a medium to high cut ankle and a much stiffer sole. 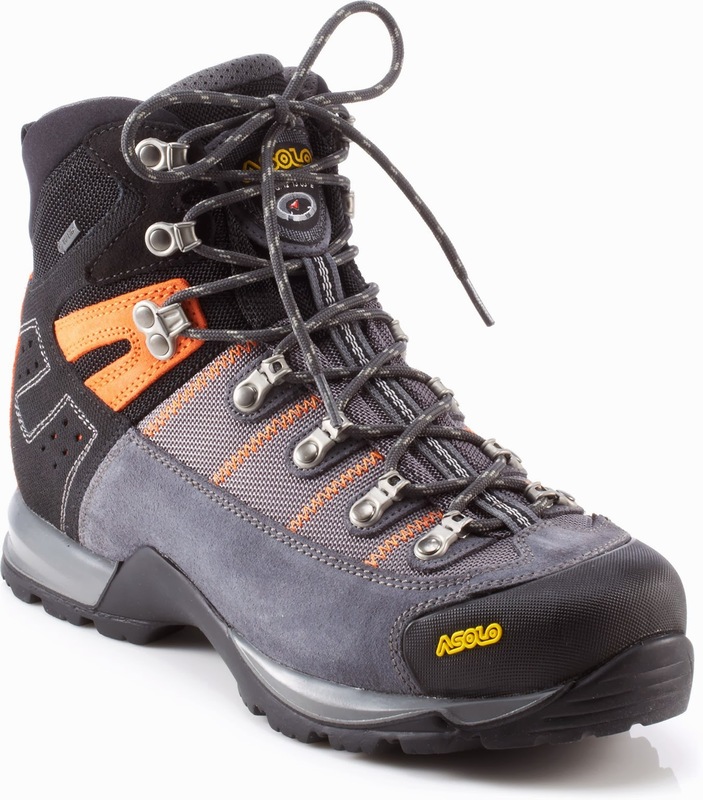 Hiking boots are designed for long day hikes or overnight backpacking trips with relatively light loads. The flexible synthetic materials used in their construction means that break in is minimal and they will probably be comfortable right out of the box. 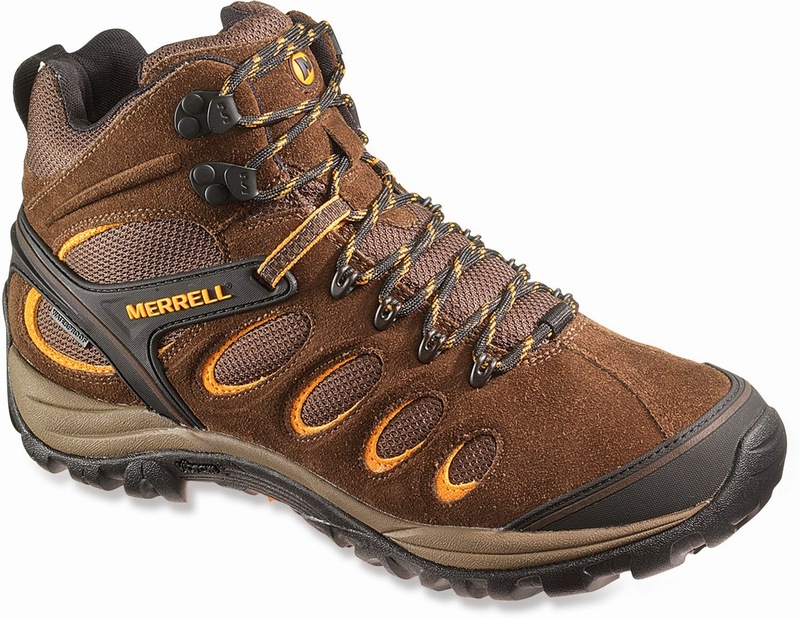 This is most likely the type of boot you should select at this point in your hiking career. Backpacking boots are designed for carrying heavy loads on long trips (4 days or more) and consequently are some of the sturdiest, heaviest boots available. These boots almost always have a high cut ankle and boast very stiff soles and leather uppers. This means you will often have a lengthy and painful break in period before they can really be worn for long periods. They are generally too heavy and hot to be of much use for casual hiking. Mountaineering style boots are for climbing mountains. These boots are heavy, warm, and extremely stiff to allow for climbing steep rock or ice slopes. The soles on these boots offer almost no flex and so under no circumstances would you want to hike with these; they will cook your feet and aren't too comfortable for walking around normally. Additional features include crampon compatibility and heavy duty waterproofing, and when you throw in their much heavier price tag, it rounds out a package that is much more than you want for hiking. As you might expect, not every boot fits nicely into these categories and they should be taken as general guidelines. There are times when a lighter or perhaps heavier boot is appropriate, but these rules are a good starting point none the less. A low cut boot extends to the base of the ankle, meaning they will offer about the same amount of support as a trail runner. Low cut boots are best suited to well maintained trails that offer even terrain as they will offer only minimal ankle support. Due to the lack of ankle support, you should not carry much pack weight with this type of boot. A medium cut boot will extend from just below to just above the ankle. They offer much improved ankle support over a low cut boot and are more suited to uneven trails and rocky terrain. 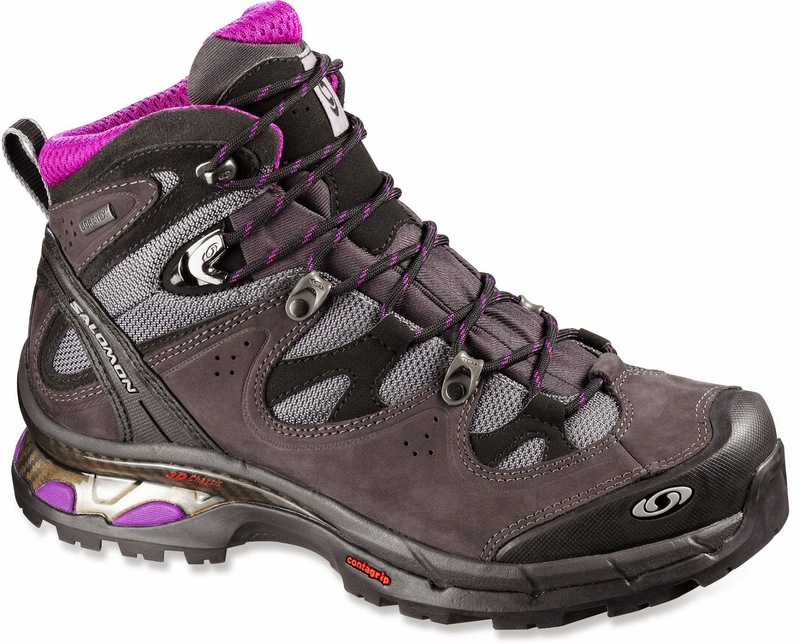 These boots offer enough support to carry a medium weight pack. High cut boots extend well above the ankle and are designed to support heavy loads on or off trail for many days at a time. The trade off with these boots is that they are heavier than low or medium boots are. Most boots on the market today are a mixture of leather and synthetic materials. For the purposes of choosing your first pair of serious boots, material is probably the least important factor you need to consider. At one time, full leather boots were the norm on the boot market. However, in recent years the total market share of this material has dropped considerably, though it is still quite prevalent. The main types of leather available are full grain, split grain, and Nubeck leather. Full grain leather: This is the heaviest and sturdiest available but also the hottest and least breathable. Split grain leather: This leather is lighter than full grain as it is only the thin outer part of the cow hide. Consequently it offers less durability and water resistance. Nubeck Leather: Nubeck is full grain leather that has been buffed for increased wear resistance and water proofing. It has increased flexibility but still needs break in like full grain leather does. In the last few years, synthetic materials have made significant inroads into the boot market. There are numerous synthetic materials available and in general they offer light weight, excellent water resistance, and good flexibility. The downside is they are not as durable as a leather. Most boot manufacturers offer a mixed design using both leather and synthetic materials to try and gain the best of both worlds. Fit: The MOST important factor in choosing a hiking boot is fit. Poorly fitting boots will ruin just about any hiking trip. I have found over the years that salespeople at outdoor stores are generally not very good at this part of helping you select a boot. I feel that this is so important I am devoting an entire section to how to fit boots. Weight: The weight of a boot is quite important to your decision and depends on what type of hiking you like. For long, fast day hikes I always recommend trying to keep the boot as light as possible. This weight savings will really add up as you pile on the miles. If you prefer shorter, rougher hikes or multi-day hikes, you can afford a heavier boot as it will provide some extra support and durability. 1. "What type of terrain am I hiking on?" The answer to the first question is probably the most difficult to predict, but in the end isn't that difficult. 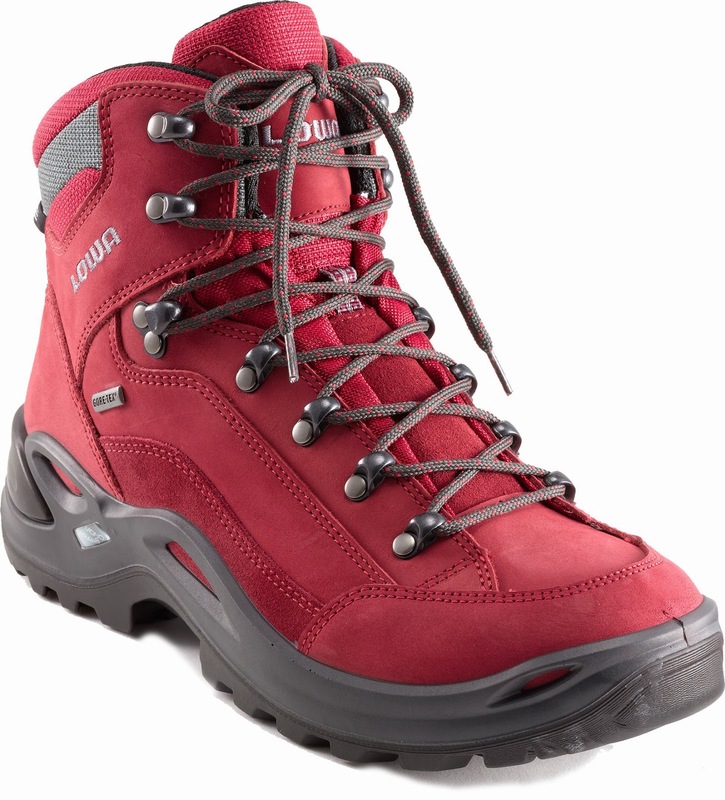 If you plan on mostly hiking on trails with just a little rough terrain, a low cut boot will be perfect. 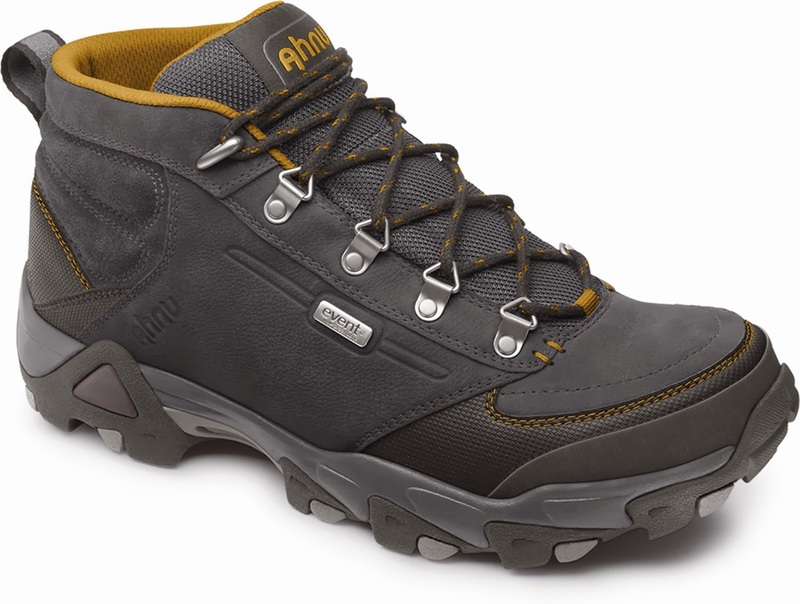 If you plan about 50/50 non-rough and rough terrain you will need a medium or high cut boot. 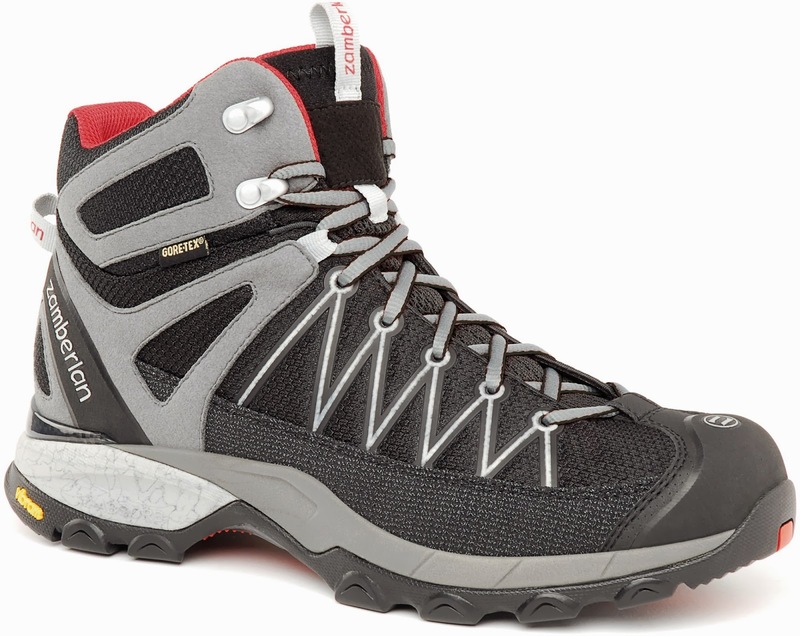 If you plan to do rough terrain with significant climbing you will definitely want a high cut boot. See? Not so tough. 2. "How long are my hikes?" The second question is much easier. For short hikes a low or medium cut boot will suffice. If you plan long or multi-day hikes you will need a medium or high cut boot to provide enough ankle support for the extra miles (and steps!) that you will be doing. 3. "Will I be carrying any weight?" The third question is also fairly simple. If you plan on not carrying much weight, low or medium cut boots are fine. If you plan to carry any significant weight (>15 lbs) high cut boots are mandatory to give you enough ankle stability on rough ground. Price: Price is important, to a point. Of course, everyone has a budget for boots that they will want to stay within. However, I generally think of the price as spread out over the life of the boot. A good pair of boots will probably last you at least 4 years, maybe more. With that in mind, I usually only use the price to exclude boots that are just too expensive for me. Once done, I don't really look at the price unless I'm shopping between different retailers for the same boot. I rarely skimp on price if the boot fits well. Breath-ability: The breath-ability of a boot is largely determined by how much venting material is on the upper part of the shoe. If you live somewhere where it is hot, you will want more venting. If you live in cooler, wetter areas you do not need this feature as much. Style: Style is last on the list here for several reasons. While some people insist looking good in the outdoors is directly proportional to how well you perform, I personally find that you can have a great time and look like an idiot if you so desire. All joking aside, the style of a boot really only needs to impress you, since by and large you will not be hiking around huge piles of people. For the most part, boots looks pretty good these days so you don't have to worry too much. If you need to match colors, some manufacturers even offer multiple color options. I purposely devoted an entire section to fitting and trying on boots because it is the most difficult and least understood part of the entire process. The fit of a boot is somewhat different that a street shoe or even a running shoe, which often leads people to incorrectly assume a boot they just tried on fits correctly. When picking out boots to try on, it is important to understand both what type of feet you have as well as the general characteristics of the boots you are considering. For example, European brands (Asolo, Salomon, Zamberlan, and Lowa etc.) tend to run narrow. If you have wide feet, you might find one that works but in general they probably won't fit as well as boots from Keen or Merrel, which tend to be wider. Some boots are also offered in wide sizes. However, the fit of the boot itself is not the only thing you need to consider. Socks are equally important to the equation and will really make or break the fit of even a perfect boot. A perfectly fitting boot is really a rare thing to find so you will almost certainly need to tailor your socks to get the correct fit. Hiking socks tend to be thicker and have more cushion under your foot than an athletic sock would. They also rise higher on your leg so you wont get rubbing from a high cut boot. I personally recommend bringing your own pair of hiking socks (though many stores have loaners of varying quality) so that you can use to asses how the boot would fit in real life. When I try on boots, I follow a specific set of rules to ensure that I can accurately gauge a boot on the correct qualities. I start out by choosing 2 different pairs of boots that I am interested in. I have found that by only trying 2 at a time, you can best judge them side by side. If you try and evaluate more pairs at once, you just end up getting confused and may pass on boots that fit better. Starting with my two pairs, I try on each pair (both boots) individually. The first thing I do with each is run through a simple checklist of items about fit to see if the boots will work or not. Size: Does the boot fit? I generally start with my normal street shoe size and work up or down from there. You don't want your toes squished against the end of the boot (lightly touching is probably ok). Width: The boot should fit snugly against the sides of your foot. This is where knowing your foot width comes in handy. You also don't want your foot to be able to slide around. A simple test I use to check this is to stand and try to spin my foot (think placing your hand palm down on a table and rotating in place). If you can do this in the boot, it's too wide! Interior size: This is probably the toughest part to check as it is somewhat subjective. You want to make sure the bulk of your foot fits. A common place to have problems is the top of your foot (where there is a bone protruding). Many boots have a somewhat shallow depth along the the tongue and if you have a vertically thick foot you will find this uncomfortable. A properly sized boot will snugly hold the bulk of your foot but not put too much pressure. A good way to gauge the correct level of snugness is to take your right hand and wrap it around your left forearm. Hold it tightly enough so that you can just barely not pull your arm out with ease. That is how tight your boot should feel. Snug, but comfortable. There are a wide array of insoles available to help with boots that may not fit internally, so don't discount a boot right off the bat if it's a little large inside. Once I have tried my first two pairs I usually will discard one, or sometimes both pairs; then it's time for two more. When I find a pair that seem to fit well, I keep them and replace the other pair until I have gone through all my possible boots. I usually try to keep the total pool to about 6 different boots at most to keep from getting overwhelmed. Now that I (hopefully) have a pair that fits well, I begin to do a more thorough test of the boot to see how they fit. It is REALLY important that you spend some quality time in the boot to make sure they do indeed fit. I find that after about 5 minutes any pressure points or tight areas will cut off enough circulation or pinch long enough for me to really notice it. Assuming that this doesn't happen I try and do two or three laps around the store, sometimes more depending on the boot. The boot should feel snug, not lift in the heel or slide around in the toe. During the walk I focus on checking how stiff the boot feels. Once a boot has passed the "walk test" I start to break out the tougher tests. Most outdoor stores have a little rock shaped stair you can try boots on. This is where I asses how well the boot grips and if I slide around while climbing or descending. I do three easy tests here to hopefully find any problems. The first is walking uphill. While stepping up I repeatedly try and make my foot slide in the boot. If I can't make my foot slide around and smash into the back of the boot it is a good fit. The second test is the reverse of the climbing test where I walk down and test to see if my toes cram into the front of the boot. This is VERY important because having your toes jammed into the front of the boot will be really painful on long hikes. My last test is to stand on the edge of the rock step balancing on my toes so that my heels hang over the edge in space. While doing this I check to see how stiff the boot is and if the collar at the back digs into my leg or ankle. If it does, you will probably have lots of painful blisters in rougher terrain. As a last check, I try and stick my finger between the collar and my leg while balancing. This will give you a good measure of how much the boot is flexing. If you can fit your finger, you are in good shape! Now, sometimes you will find a boot that passes all the tests and fits almost perfectly except for one tiny pinch point or sharp seam. If this happens, ask for another pair of the same boot. There is a large variation in the exact size and workmanship quality of boots from pair to pair. It is almost impossible to make two pairs of boots identical because they are constructed by hand. So if you find a pinch point in an otherwise great boot, another pair will probably not have the same issue. If the issue is solved, you have found your boots. I generally don't try and adjust the socks in this situation since the pinch won't be resolved by thicker or thinner socks. Once you take a pair of boots home, I also usually recommend that you wear them around the house (inside only) for the rest of the day. This will allow you to really make sure they still fit during a longer wear while still giving you the option to return them. Now, all this information can be somewhat overwhelming all at once, and rightly so. Choosing a new pair of boots is daunting. To give you a real world case study of the process, I enlisted my wife Robyn, who conveniently happened to be buying a new pair of boots. Her decision to purchase a new pair of boots was based on several factors which greatly influenced the choice of boot style. The first and most important factor was that up until now she has been hiking in a pair of Salomon trail runners, which she loves, but she has not owned a pair of heavier boots for those adventures when we really need them. Secondly, we have been planning several tough trekking trips in the coming months which will be particularly punishing to ankles and feet if not properly protected. Robyn has had a history of swollen ankles, so we made the decision that the new boots would be at a minimum a medium to high ankle boot to ensure there aren't any nasty injuries while out in the boonies. Prior to setting off, I did extensive research on available boots that would potentially fit her needs (something I highly recommend doing) so that I could hopefully steer her away from any poor performing boots. With a ton of boot intelligence in hand, we headed to our local outdoor store where Robyn took her first pass at the boots available. While she was looking at boots, I did my best to refrain from pushing her towards any specific boots; the last thing I wanted to do was to pressure her into a boot she wasn't wild about. Since she has a relatively difficult foot shape to fit, I recommended she try on two sets of boots that were fairly similar each time to help narrow down a manufacturer or rough shape that would work, rather than confusing the issue by trying wildly dissimilar boots. For trying on boots, Robyn opted to use several thick loaner socks at the store, as she didn't have a proper pair of hiking socks to try on with higher boots. The first two pairs of boots she selected to try on were the Lowa Renegade and Lowa Bora boots. She started with her street shoe size and both pairs were fairly accurate on sizing. However, Robyn has slightly upturned toes and so the vertical space in the toe boxes was not quite adequate. She also found that the top of the shoes were digging into the back of her ankles, so both pairs went back to the shelf. Next up were the Ahnu Montara and the Ahnu Sugarpine. Both of these boots offered a large toe box and a slightly wider fit. Once again, her street shoe size was correct and the boots fit well overall and were comfortable. However, in this case we found one of those instances where there is one small item that ends up being a deal breaker. Robyn has a slightly more protruding bone on the top of her foot (which often makes shoes difficult to fit) and in both of the Ahnu boots the tongue dug sharply into her foot. At first, I suspected this might be something with that particular boot, but both pairs pinched in roughly the same location. We discarded these after judging them as a step closer, but not quite right and looked for boots with roughly the same amount of space on top of the foot. The obvious contenders for this seemed to be the Vasque Breeze and Salomon Comet 3D. She immediately discarded the Vasque boots with a pinching tongue, but upon trying on the Salomon boots she immediately had an "AH HA!" moment. The boots were pinch and pain free and had plenty of space in the toes and above the foot. With these boots picked out, she spent some time wearing the boots around the store and running them through their paces. Both climbing and descending offered excellent foot support and plenty of grip, even on the steepest test terrain available. Standing on the edge of the platform caused no excessive ankle issues from the collar and so she declared them a good boot. Over the coming weeks, we will continue to test out these boots to see how they perform in the wild. One thing I didn't see covered was the issue of duck feet. For example, I have 15EE feet in the front and something more like a 15D in the back by my heels. I also have bony ankles so when the tongue wraps around my ankle, it frequently jabs the nerves on both ankle bones. How would you solve this problem fit? I've gone through many many boots and had them fail on me in a variety of ways. Your test sequence will save me from making future bad decisions. finding a boot that accommodates that wide front foot and narrow heel is quite a challenge. This shoes guide isn't about purchasing new shoes. It's about figuring out how to utilize the ones you as of now have, better. That is somewhat of a head-scratcher however. What could there be to utilizing a couple of wide width shoes other than pushing your feet in them and taking off? Really, there is a considerable amount to think about how you do up your bands that can totally change the way you shoes perform on your feet. Taking your child on a nature walk into a forest or to a mountain near your home can be a lot of fun, and can be a great bonding activity. outsidebuzz You should choose fishing attire according to the weather on that particular day.